END HUMAN SUFFERING BEHIND OUR FOOD. Human suffering should never be an ingredient in the food we buy from supermarkets. Yet, millions of people around the world, many of them women, who farm, fish, and process the food in our stores are working extremely long hours, toiling in unsafe conditions, and earning only poverty wages. To illustrate this problem, Oxfam looked at the seafood in our supermarkets. Pressure from supermarkets to keep costs low means that the people who fish and process seafood face harsh and degrading conditions on a daily basis, and receive wages that are sometimes so low they struggle to feed their families. With this campaign, we aim to raise the voices of the people who produce our food to ensure they are treated and paid fairly. Join Oxfam to help create a more equal and just food system–one that isn’t built on human suffering, discrimination, and unsafe working conditions. As some of the biggest supermarkets in the country, Whole Foods, Stop & Shop, and Giant have a responsibility to act. Because we are their customers, we have the power to demand the people behind the food in their stores are treated humanely. Act now to help end the human suffering behind our food. Human suffering should never be an ingredient in the food we buy. Millions of farmers and workers who produce our food are forced to work long hours in inhumane conditions. Call on supermarkets to help end human suffering behind the food we all eat. Thank you for signing the pledge to end human suffering in the food we eat! Want to do more? Share this campaign on social media! We're asking you to take action against human suffering. Find out how you can help us send a message to Whole Foods. 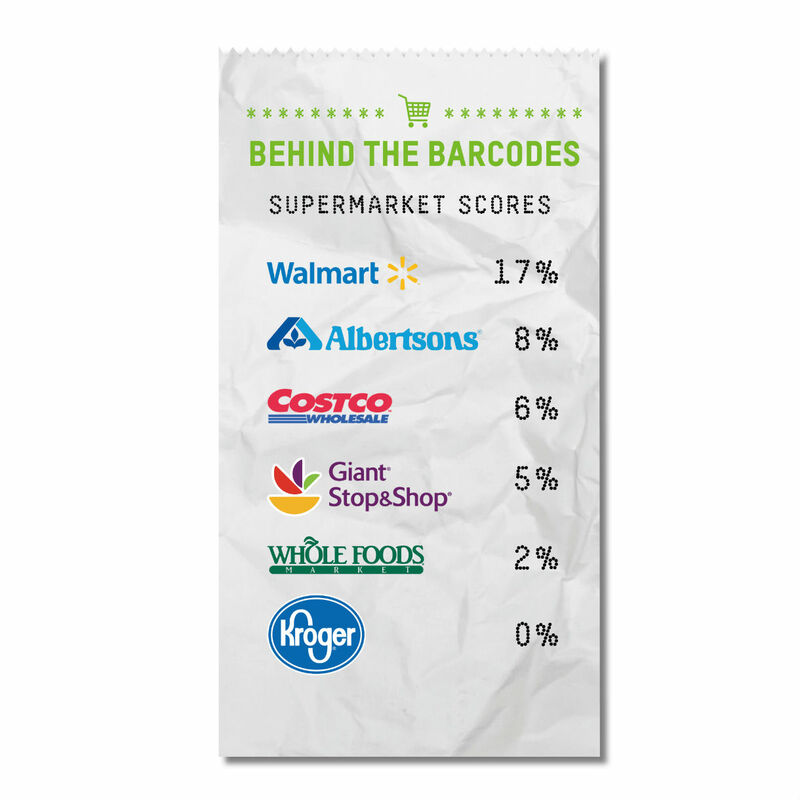 How does your supermarket rank? Big supermarkets have great power and influence over their supply chains and the small-scale producers who work within the system. Oxfam assessed the six biggest retailers in the United States on how they tackle critical issues affecting the people who produce the food they sell. We did this by examining publicly available information relating to their policies and evaluating it against indicators in four areas: transparency and accountability, workers, farmers, and women. The overall results reveal that US supermarkets are failing to do enough to protect the rights of the workers in their supply chain, address the rights and equality of women, support small-scale farmers and be transparent throughout their operations. 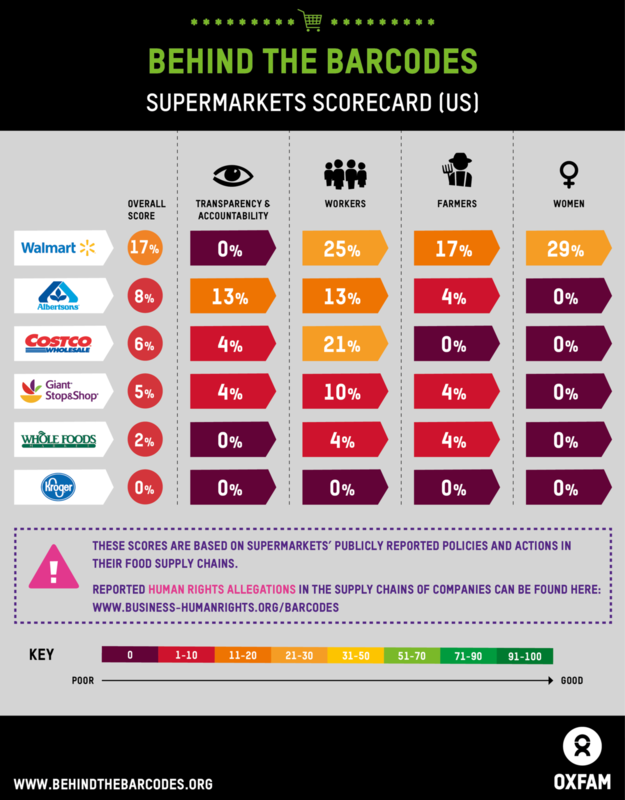 None of the six supermarkets we looked at in the US scored any points for policies supporting the right for workers in their supply chain to earn a living wage, and just one scored at all on respecting the rights of women. The scorecard indicators for the workers theme did not measure the supermarkets’ treatment of workers in their own stores. For more information on how this scorecard was developed, please see our methodology note. For the full scorecard results, please click here. Known for being one of the most sustainable supermarkets in the industry, Whole Foods is actually one of the worst performing, ranking second to the bottom with an overall score of 2%. Whole Foods has a lot to improve in all categories, especially in terms of supporting women and being transparent. The company scored 4% for transparency and was notable for naming the senior executive responsible for ensuring human rights are respected. On worker’s rights, parent company Ahold Delhaize published labor rights policies for their supply chains and included a commitment to proactive prevention of forced labor. The company also scored 4% in the farmers category by providing examples of sourcing relationships that transfer value to small-scale producers, but didn’t score on the women theme. This giant supermarket has made improvements to its policies around women over the past few years, including commitments to increase the number of food products it sources from women farmers. However, Walmart wasn’t able to score anything around transparency and accountability. 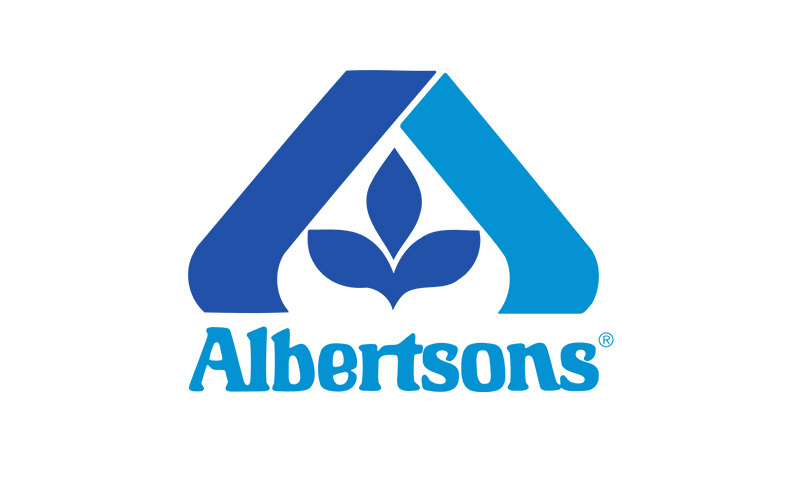 While Albertsons received its highest scores around workers and transparency and accountability, having good practices in place that require its suppliers to disclose and prioritize human rights risks taking place within its supply chains, it fell flat on the treatment of women and small-scale producers; with little to no scores in these two categories. 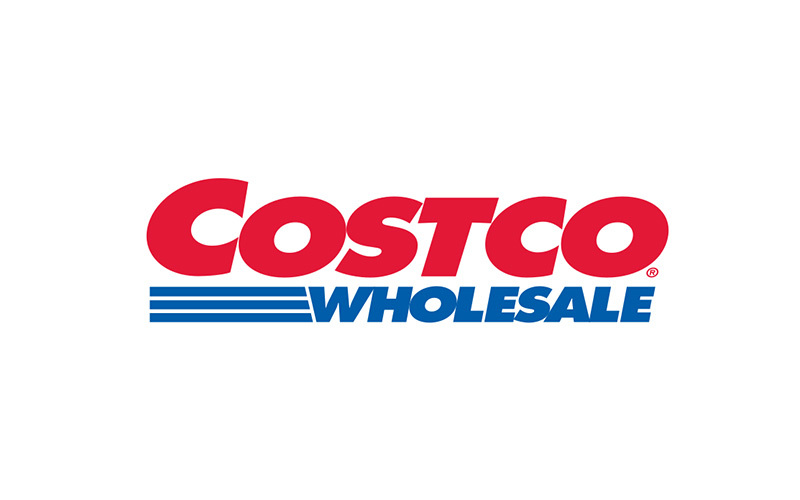 Known for its fair labor policies at home, Costco still has a lot of work to do in implementing good practices for women and men in their global supply chains. The supermarket didn’t score at all in the small-scale producers and women themes, demonstrating the need to improve its commitments to empowering those working within their supply chains. Costco also scored low around transparency, and has room to improve on its transparency within its supply chain. 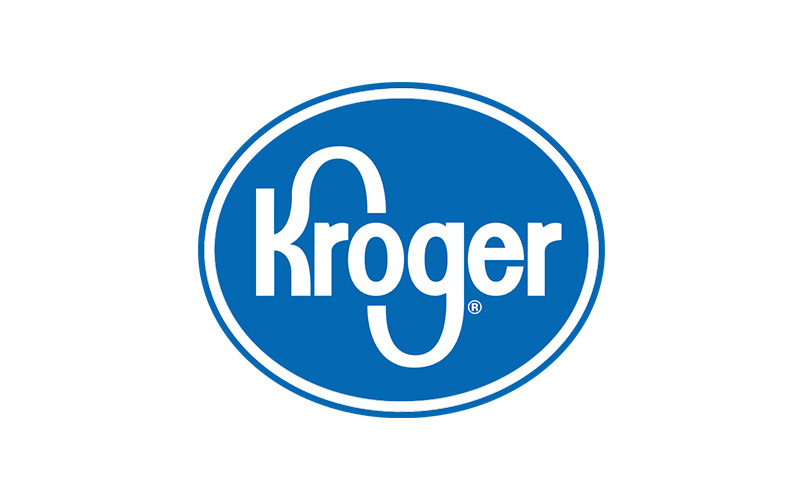 The worst performing supermarket in Oxfam’s scorecard, Kroger scored zero in all categories. While the supermarket has put in place a vendor code of conduct for its suppliers to have a zero tolerance policy for human rights violations, they need to adopt stronger policies regarding disclosing gender-pay ratios and providing better opportunities for women workers in their supply chains, being more transparent around its suppliers by releasing their names, and empowering small-scale producers within their supply chains. The profit small-scale farmers and workers receive, on average, from every dollar you spend at a supermarket. The time some workers on fishing boats are at sea, sometimes earning less than $0.50 an hour. The amount of time it would take a female seafood worker in Southeast Asia to earn the annual salary of the highest-paid US grocery store executive. Three workers describe the low pay, the extreme hours, and the inhumane conditions that are far too common in this industry. The best Prime Day deal Amazon and Whole Foods can offer is safe working conditions for the people who produce our food. Help us spread the word about our #BehindTheBarcodes campaign and hold supermarkets accountable for the mistreatment of farmers and workers around the world.